"At church functions, folks line up for this trifle. And it is so easy to make!" 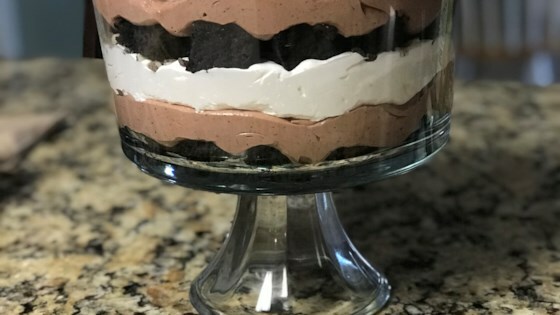 In a trifle bowl or glass serving dish, place half of the brownies, half of the pudding mixture and half of the 12 ounce container of whipped topping. Repeat layers. Shave chocolate onto top layer for garnish. Refrigerate 8 hours before serving. A chocolate lover’s delight with brownies, chocolate pudding, and whipped cream. This was absolutely delicious! I substituted bailey's irish cream liquer for 1/4 cup of the water. Yum!! !